YouTube is one of the most popular platforms in the world, and probably the number one for videos. It also allows anyone to upload their own videos and get feedback from other people. But there’s a flip side to it as well. When you put something out there online, it’s exposed to all kinds of feedback – not just the positive, loving kind. And you might just get dislikes or mean comments every now and then. People commenting on things online can often be mean, because they can hide under a nickname and never say what they wrote to the person’s face. Some of them can also be pretty nice. But there’s another kind of comments, a better kind. The kind that makes you want to watch YouTube videos and go through the whole comment section once you’re done – the funny commenters. These people crack jokes in the comments, that are often funnier than the video itself. Their comments are so clever and witty, they’ve gone viral and made people all over the world laugh hysterically (us included!). 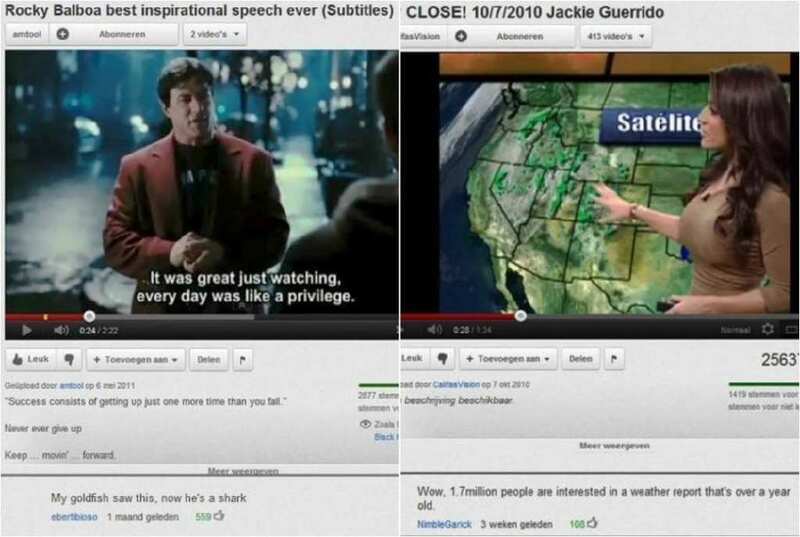 Who knew the most hilarious things you could see on YouTube are actually in the comment section? Aaron Paul is a talented actor, mostly known for his role as Jesse in the crime drama Breaking Bad. After the show was over, he moved on to other projects, like starring in the video game-based film Need for Speed. But not everyone have moved on, as it seems. It seems that Jesse’s old boss, a chemistry teacher who goes by the name of Walter White, tracked him down just to tell him to get back to work. Talk about micromanaging! We love Miley Cyrus. But we have to admit some of her more recent music videos contain activities that are generally less recommended for the general public. 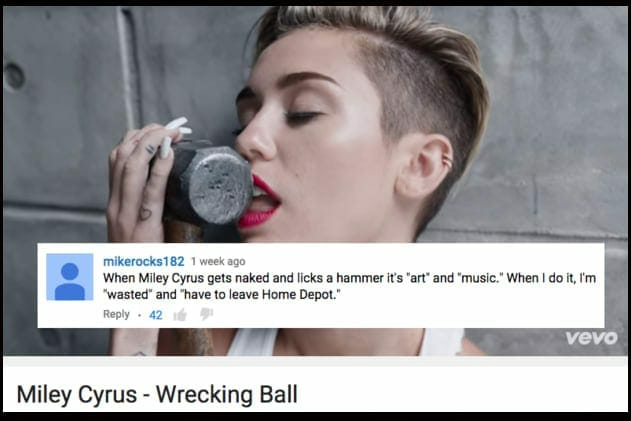 For instance, using hardware tools as props like she did in the video Wrecking Ball. But people have got to learn that whatever works for pop stars on MTV, will not necessarily work in real life. You’re not Miley Cyrus, and you might just get arrested for it. Twilight is one extremely successful vampire saga, but not everyone is a fan. Some would say the lead actress, Kristen Stewart, didn’t really give her best performance in those films, and lacked, well… facial expressions of any kind. 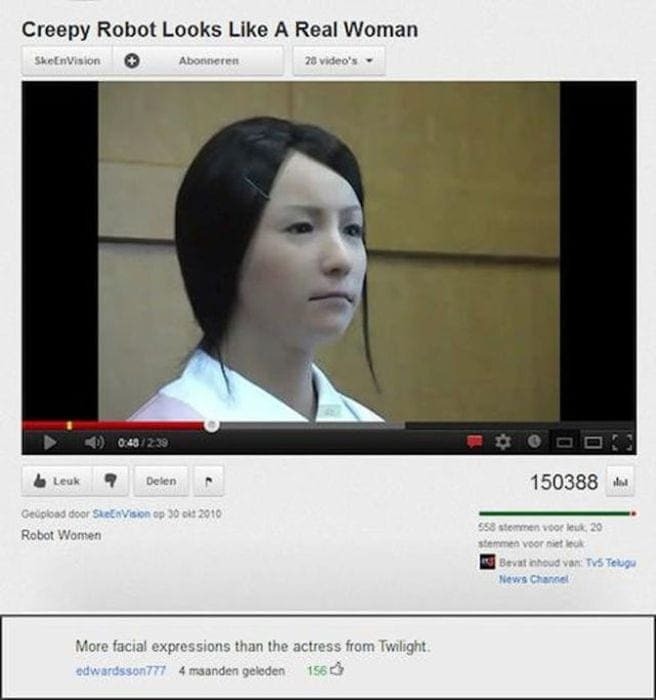 This video, of a robot that looks like a real-life woman, actually had someone commenting that the robot has more facial expressions than Kristen. We think it’s a little harsh, but it’s also pretty hilarious, and over a hundred people agreed. Every video on YouTube have a “like” and a “dislike” button. It’s a way for people to comment whether they liked the video or not. But the Bob Marley song One Love is so good, this commenter had another theory as to why people hit that dislike button. 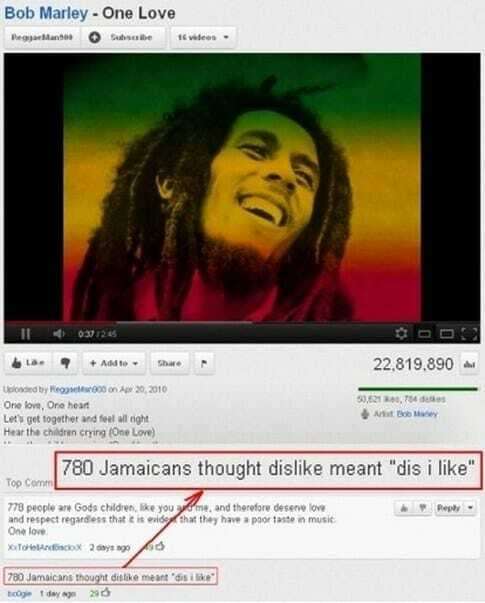 In a Jamaican accent, “this I like” can sound much like “dislike”, which can explain the dislikes! If we ever post our own YouTube video, we’ll keep that in mind if we ever get any dislikes. It’s not us, it’s Jamaicans! Jackie Guerrido is giving a weather report in this video which dates back to 2010, and for some reason, people have found it really fascinating. Perhaps it’s because of Jackie’s lovely personality, or maybe it’s due to some of her other features. Either way, this commenter rightfully pointed out that this weather report from over a year earlier than when he posted his comment had 1.7M viewers. Unsurprisingly, it now has four million views. There’s a reason why news channels hire attractive weather girls, we’re just saying. 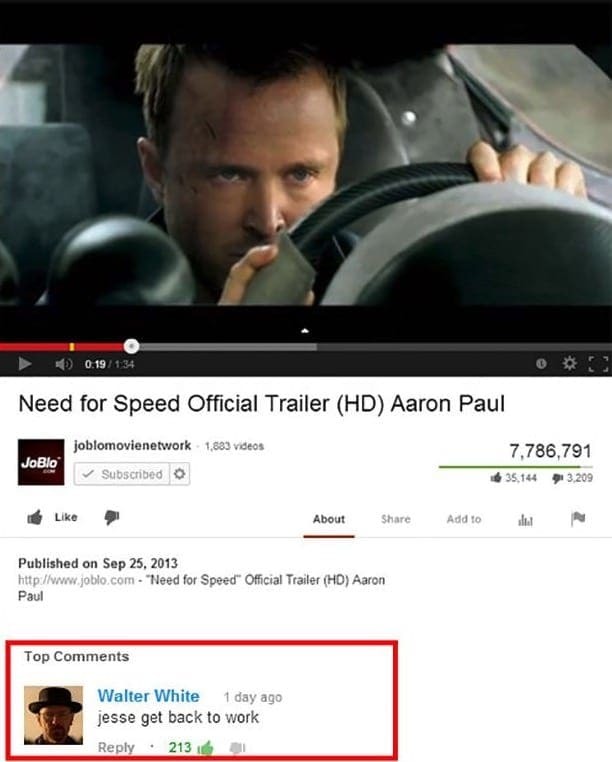 This comment is so clever, we think it might be the best thing on this list. See, a baby red panda is often called a “firefox”, similarly to the internet browser Firefox. 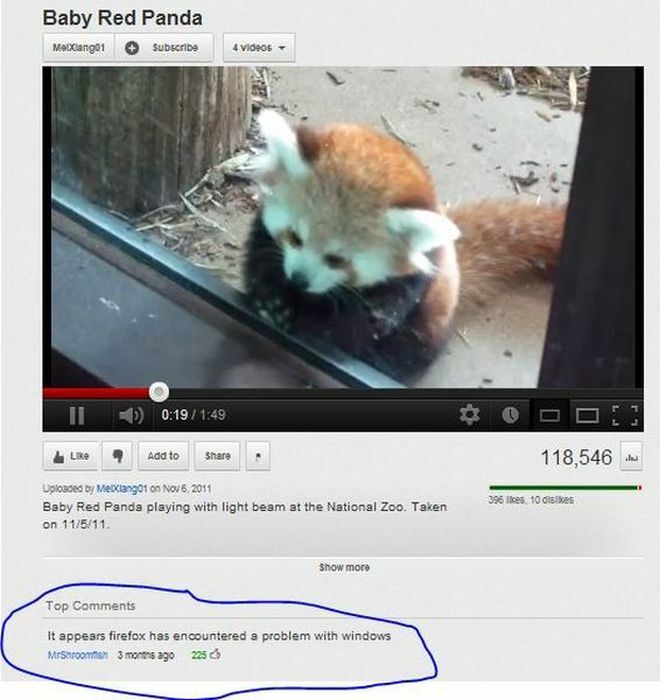 Since this firefox is standing in front of a window and can’t get through, this commenter made this incredibly cute comment, “It appears Firefox has encountered a problem with Windows” – a message you might get if you use it as a browser. Double the pun, double the fun! Everyone loves Disney movies, and especially The Little Mermaid, about the mermaid Ariel who just wanted to be part of the human’s world outside of the water. And just like Harry Potter’s Ron Weasley, she’s also red-headed and obsessed with Muggles… humans, that is! 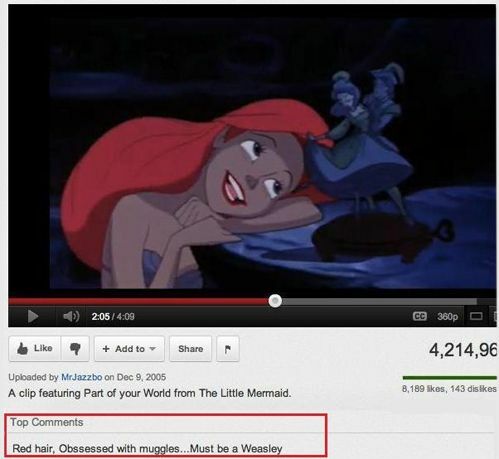 So it’s only logical to conclude that Ariel is also a Weasley. They are famous for their red hair, and the Weasley family does hang out with humans (sorry, Muggles) quite a lot. Have you ever watched such a bad movie, you felt like just storming out of the theater despite already paying for the ticket? Some movies are so bad, you don’t mind the consequences – you just want to stop watching them! 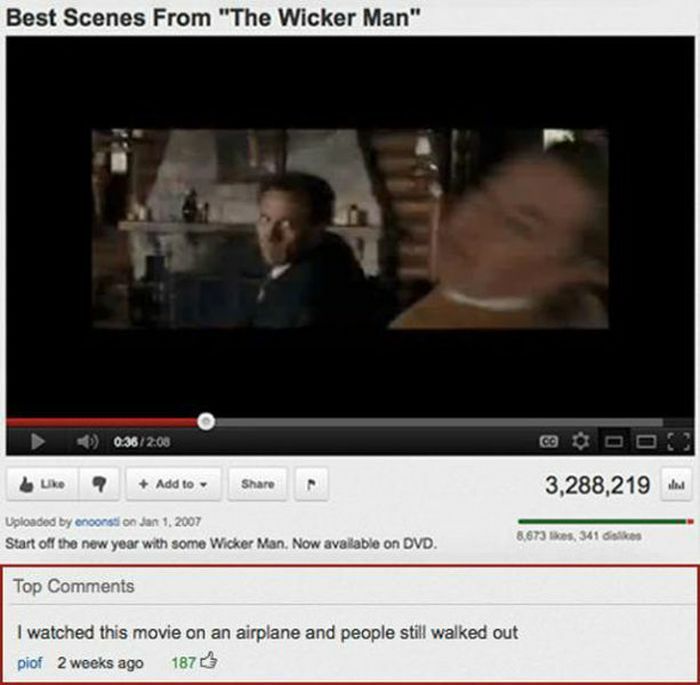 This person hilariously commented that the movie in this YouTube video is so bad, people have walked out from it on an airplane. Which basically means they preferred to be killed than keep watching it. It’s a matter of taste, but we still find it pretty funny. Many people tend to think they’re experts on all kinds of matters. This guy, for example, uploaded a video where he demonstrates how to punch an opponent and strike fast. He chose to demonstrate this on a mannequin with no arms, so he pretty much got what was coming to him when this commenter came across his video. He asked what to do if his opponent actually has arms, and over 5000 people loved his clever remark. And to answer his question – in that case, we suggest you run. Ralph Macchio was the star of the cult film The Karate Kid, and it was one of those roles that people don’t easily forget. Until this very day, he still gets called Daniel everywhere. 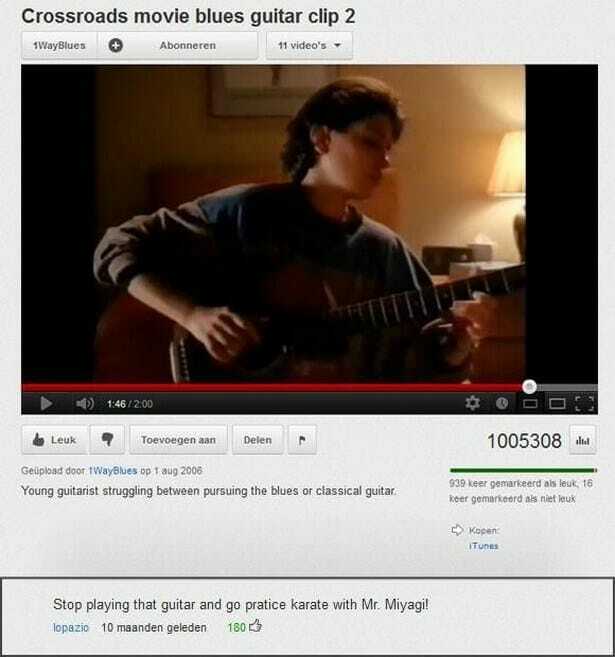 When this clip from the 1986 movie Crossroads went on YouTube, someone carried on the joke and told him to quit playing around and go practice with Mr. Miyagi, Daniel’s legendary karate master. Some people just can’t let actors move on with their lives… poor Daniel! James Gandolfini was one of the most beloved and talented actors in the world, who was mainly known for his winning role as crime family boss Tony Soprano in The Sopranos. The actor passed away in 2013, but some people haven’t given up on the possibility of him making a return (or they’ve watched too many sci-fi films). 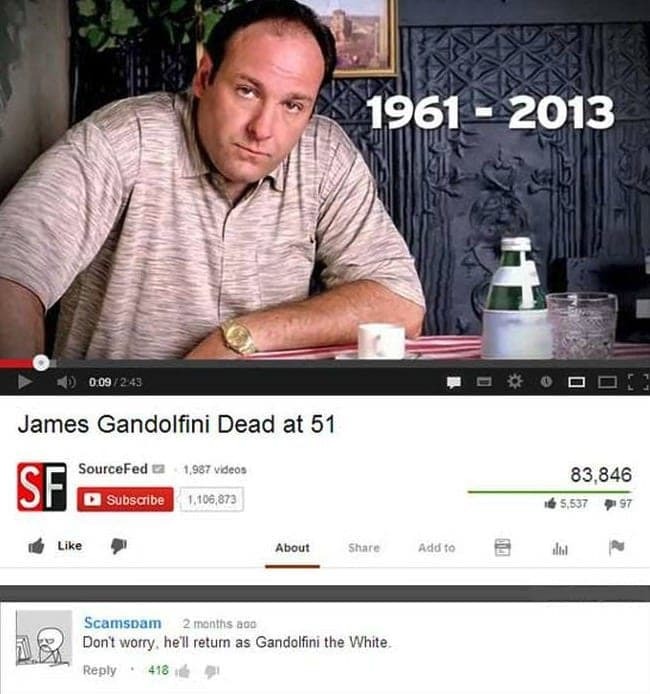 So just as the beloved Gandalf in Lord of the Rings returns as “Gandalf the White”, this commenter thought maybe James will return as “Gandolfini the White”. We could only wish! There’s really nothing better than watching animal videos on YouTube. If you’ve never tried it, we highly recommend it as therapy. 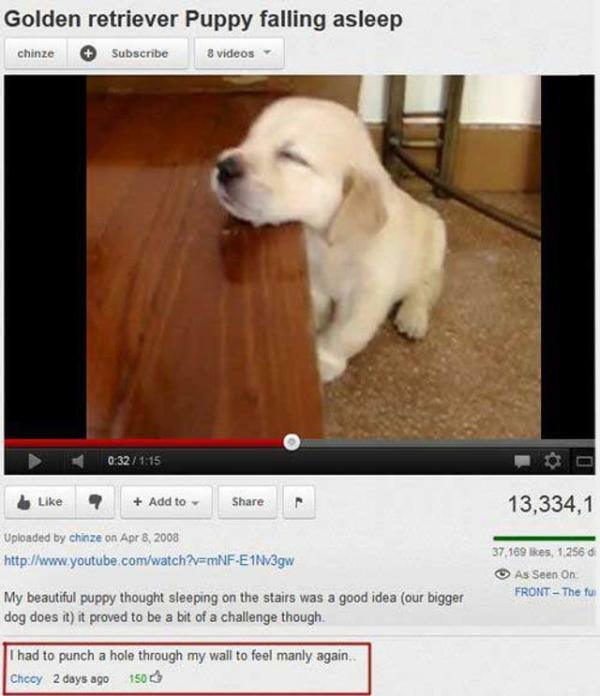 This guy watched a video of a puppy falling asleep on its owners’ stairs, and it proved to be too much for him. This kind of videos can make you feel so warm and fuzzy inside, even if you’re a big, tough, manly man. But there’s no need to punch a hole through a wall, you can just watch ESPN. Or even better, embrace your feminine side. It’s great! Probably everyone would agree that Rocky is one of the best motivational movies of all time. He was the boxer who never gave up, and inspired many to follow their dreams. 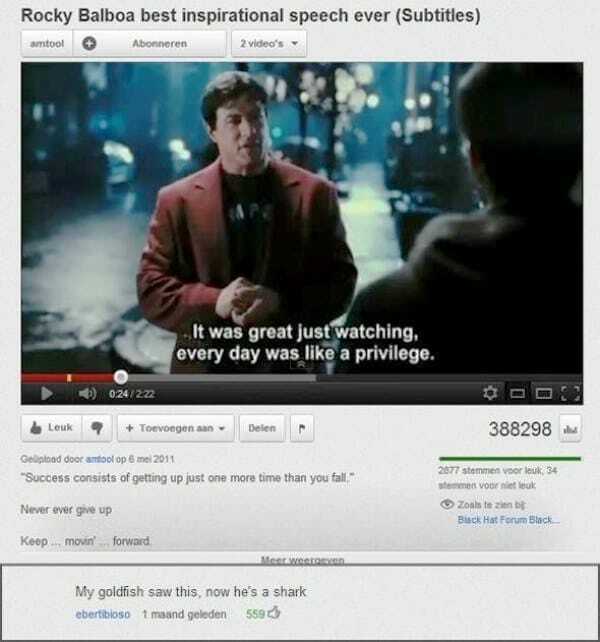 In this video, Rocky gives a motivational speech that is so fierce, one commenter wrote his goldfish saw it and became a shark. We suggest you don’t try showing this video to your fish at home, unless you have a really big fish tank. 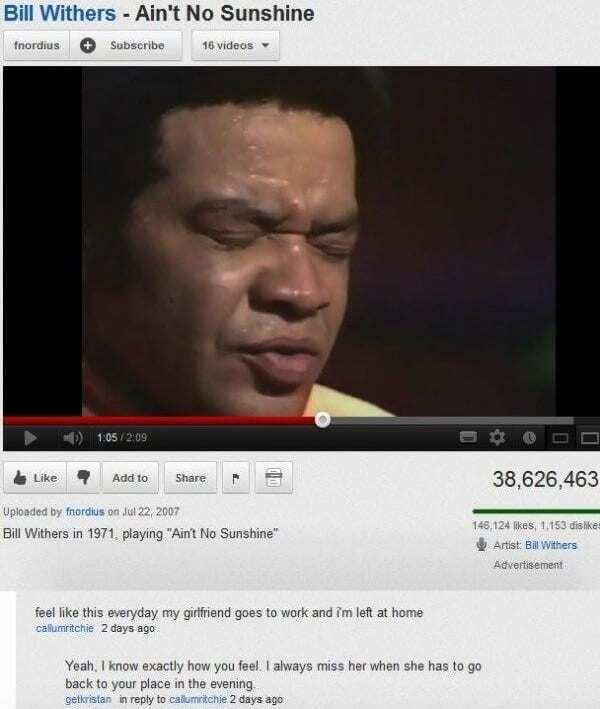 Bill Withers’ song, Ain’t No Sunshine, can trigger some powerful emotions in people when they listen to it. After all, it’s pretty touching. This commenter just wanted to share with everyone that he feels bad whenever his girlfriend leaves to go to work, but got the response of a lifetime. The commenter below said he misses her too whenever she leaves his house and goes back home in the evening, which is pretty mean when you think about it… but also kind of funny. Like we’ve said, music artists can engage in certain activities that us regular folk cannot allow ourselves to engage in. 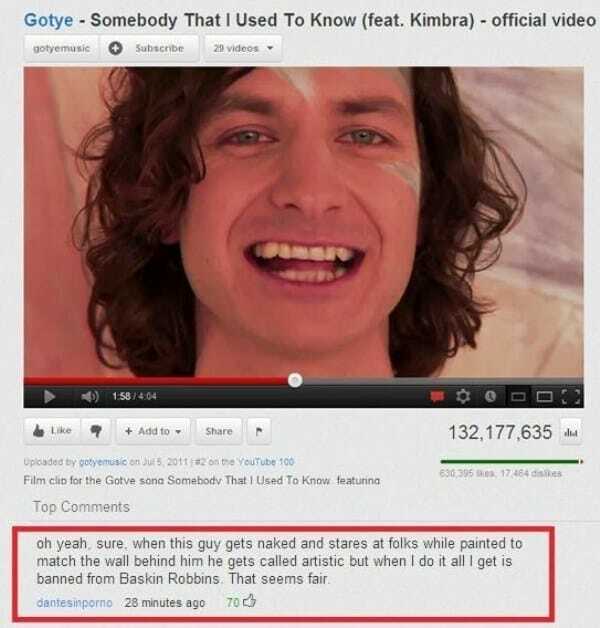 For example, singer-songwriter Gotye, who rose to fame with his hit Somebody I Used to Know, took off his clothes for the music video. He was then painted to match the wall, so it was quite the artistic video. But when this commenter tried to do the same in an ice cream shop, he was banned! Well, when we think about it – that makes sense. When you watch a video, you don’t always notice all the little details. But some details are so glaringly in-your-face that you just can’t ignore them. 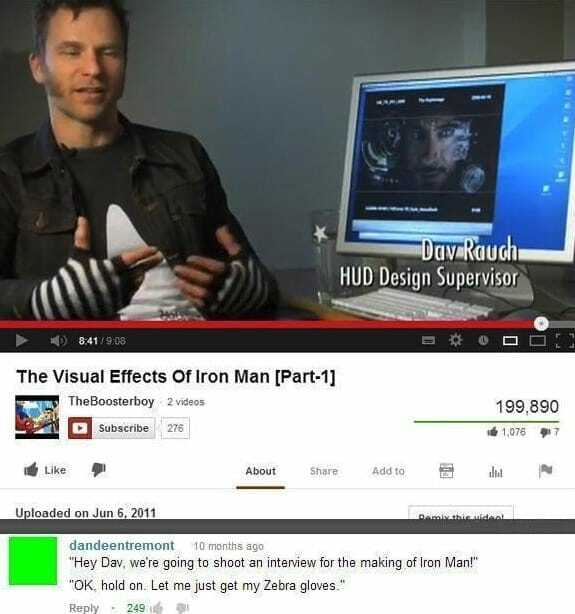 For instance, in this video of Dav Rauch interviewing about Iron Man’s visual effects, he’s wearing fingerless zebra gloves that look like they came out of a time machine and landed in 2011 on some man’s hands. These gloves are so outdated, it made commenters notice them more than anything else in the video. This is yet another adorable animal video that we just can’t get over. This sweet little loris is eating a rice ball, and all we can think about is its big googly eyes! It is, in fact, so cute, that this commenter said he would do whatever this Loris asks of him, no questions asked. 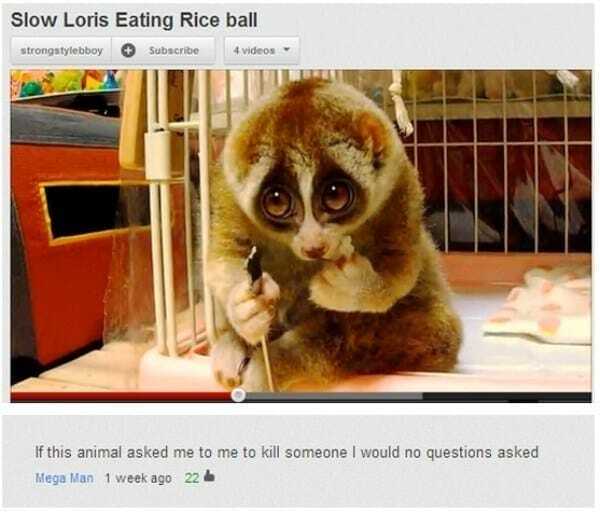 And to be honest, we can’t think of a single thing this loris would ask us that we wouldn’t do, because it is adorable! Sometimes you find yourself late at night, watching YouTube videos. Sometimes you get swept up and do it for hours and hours, only to realize later that you’ve just watched eight hours of dancing goats. YouTube can get you sucked in like that sometimes. 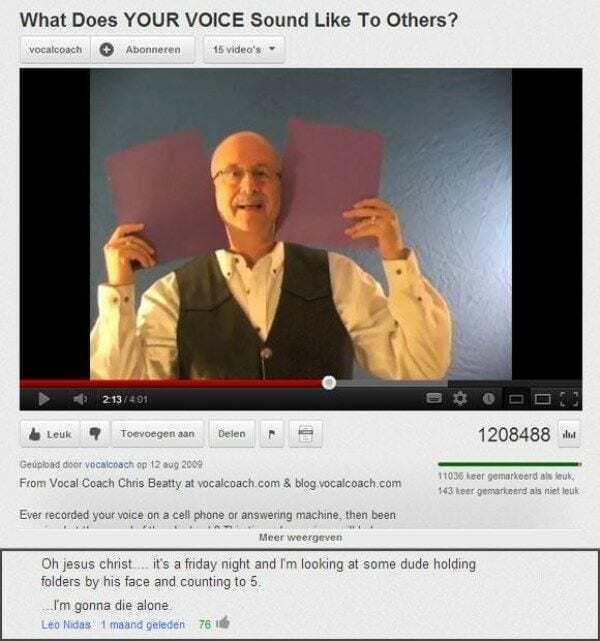 This guy realized he was watching this vocal coach holding up folders to his ears on a Friday evening, instead of going out and meeting a girl, and decided to share his pain with the rest of us. We feel you, Leo Nidas. Nature can be a pretty harsh thing, what with all the natural selection and stampedes of wildebeest killing lions. In the Disney film The Lion King, Mufasa tells his son, Simba, all about how Lions are at the top of the food chain in the animal kingdom (at least when humans aren’t around), and they sing a cute little song about it called The Circle of Life. 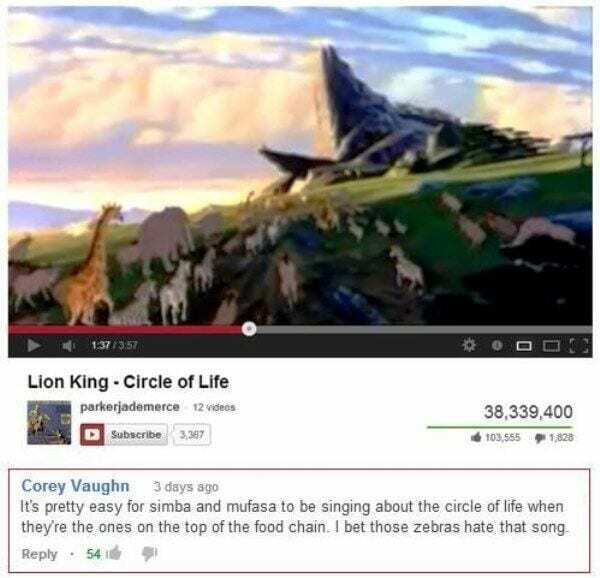 But like this commenter said, we’re pretty sure zebras – who are at the bottom of the chain – don’t like the song as much. It’s one of the funniest moment in Harry Potter and the Chamber of Secrets, when Ron gets a howler from his mother Molly for stealing his parents’ car to get to Hogwarts with Harry. 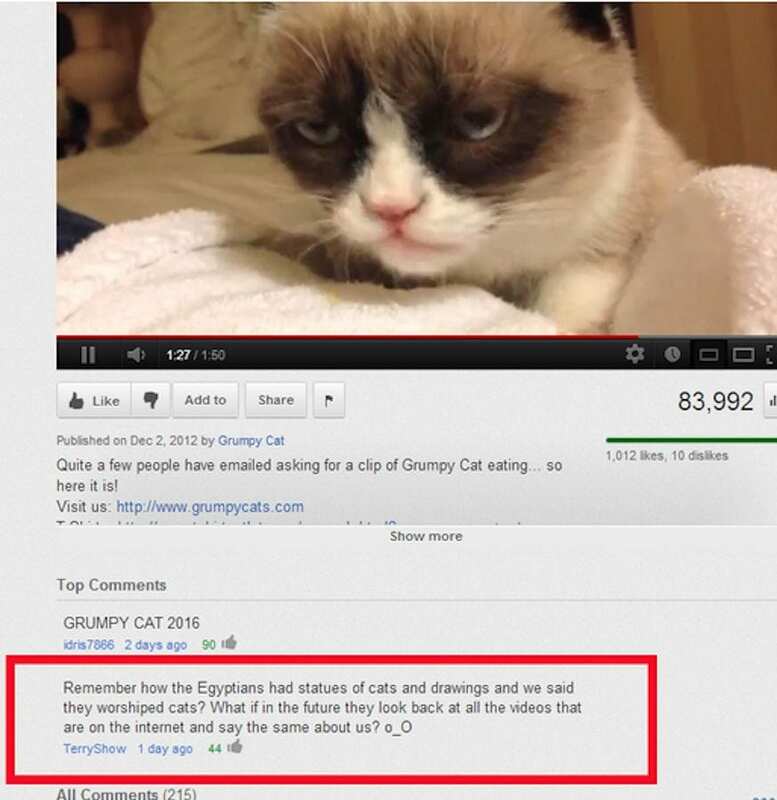 But this comment is even funnier! 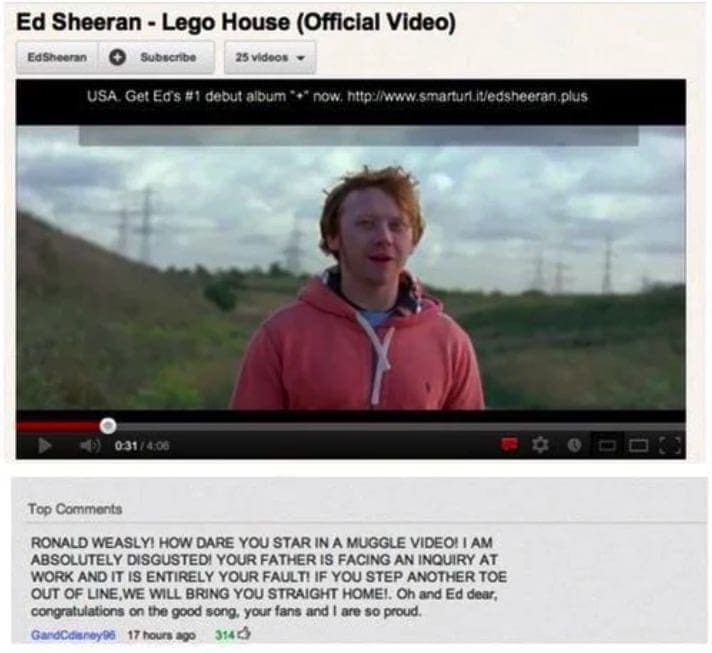 As Rupert Grint (who plays Ron in the Harry Potter movies) starred in Ed Sheeran’s video, Lego House, someone thought it would be hilarious to leave him a “howler” of his own – and it really, really is. When you upload a video of yourself explaining how to do something – cooking up a delicious recipe, for example – you need to do a great job at explaining it the best you can. This fact started a YouTube trend of commenters trolling the video makers by telling them their instructions weren’t clear and caused ridiculous results. 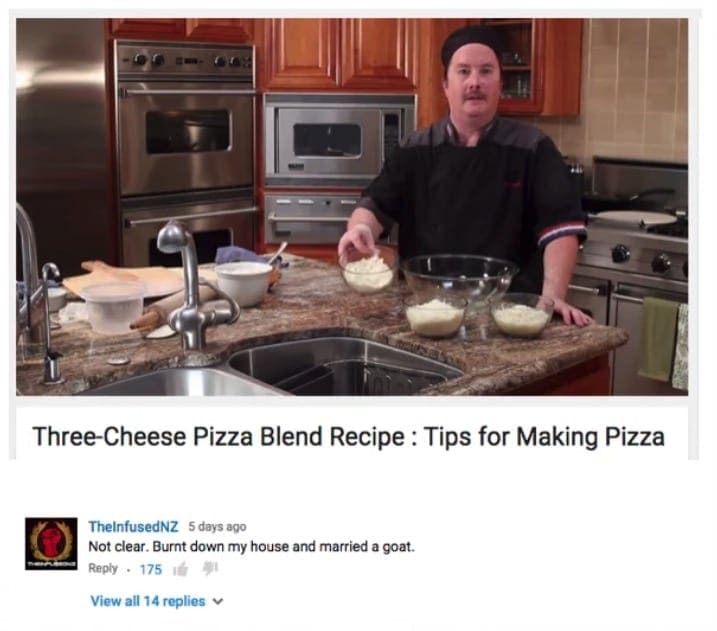 We hardly think his three-cheese blend pizza recipe suggested anyone to marry a livestock animal, or burn down a house. This commenter actually raises an important question. How would future generations perceive us when they find out what kind of YouTube videos we’ve been watching all these years? If aliens were to come visit humanity at this time, they’d probably think we hold cats as sacred and are hypnotized by unboxing videos. We should really consider the things we watch in our spare time, because this comment is making us question our entire way of living. Now that we feel depressed, we’ll go watch a cat video to calm down. This video raises so many questions. For starters, if this commenter was looking for a Christmas song, why did they come across this video? Secondly, why does a video of a hippo “explosively” doing his business even exist? Well, the answer is in the video itself. It starts off slow, with a couple of hippos just walking around, but some people would find the end explosively hilarious. And we’re pretty sure this commenter had a pretty good laugh as well.